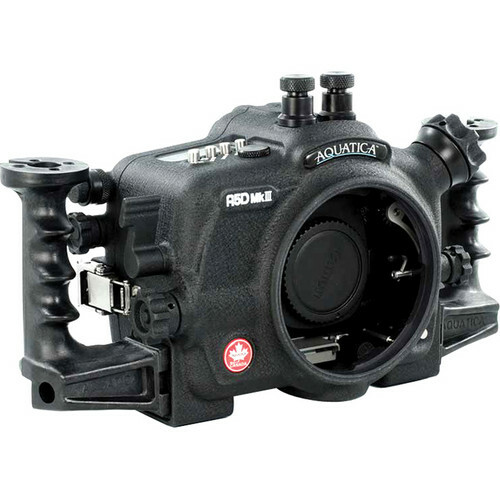 The A5D Mk III Underwater Housing for Canon 5D Mark III from Aquatica is a waterproof case enabling you to shoot beneath the water's surface with your Canon 5D Mark III digital SLR camera. Although it will also fit the 5Ds or 5Dsr, one of the controls will not work well on those cameras in this enclosure. For that reason, there is a separate housing, the A5Dsr Pro, designed for all 3 cameras. The A5D Mk III housing has a depth rating of 295' (90 m), which is upgradeable to 426.5' (130 m). This enclosure provides access to virtually all camera functions via mechanical controls. A redesigned camera tray smoothly and precisely positions the camera in the housing and is easily disengaged by a simple push on a tab. The housing also has an ergonomic design with 2 grip handles for great handling beneath the water's surface. Carefully crafted from a selected alloy of aircraft-grade aluminum and premium-grade of stainless steel, the housing is machined on advanced 5-axis computer-assisted machines. It is then protected by anodizing to North American military specifications for further protection. The housing features corrosion-resistant zinc anodes and a durable powder coating. The housing has an interchangeable lens port system, which will accept a wide variety of wide-angle, zoom and macro lenses. A port is required but sold separately. The housing has a pair of Nikonos strobe connectors, each with 6 active pins. It also features the standard viewfinder. The Aqua View Finder is optional. Safe to use at depths up to 295' (90 m) - upgradeable to 426.5' (130 m). Box Dimensions (LxWxH) 11.5 x 9.2 x 6.7"